Students will be able to identify the main topic of a text. Students will be able to retell key details of a text. 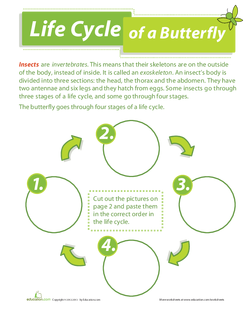 Students will be able to identify the sequence of a butterfly’s life cycle. Draw a KWL chart on the board. 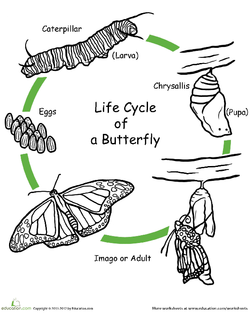 Ask students what they already know about the life cycle of a butterfly. Fill in the "K" column. Ask students what they would like to learn about the life cycle of a butterfly and fill in the "W" column. Pick out key words from the song, such as Butterfly, Caterpillar, Chrysalis, and Egg. Include a picture and a simple definition for each word. 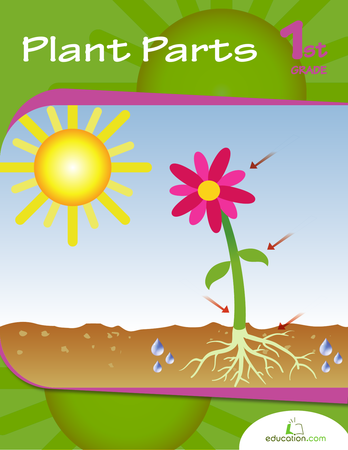 Show pictures of real eggs, caterpillars, chrysalises, and butterflies to your students. Ask students to identify each. 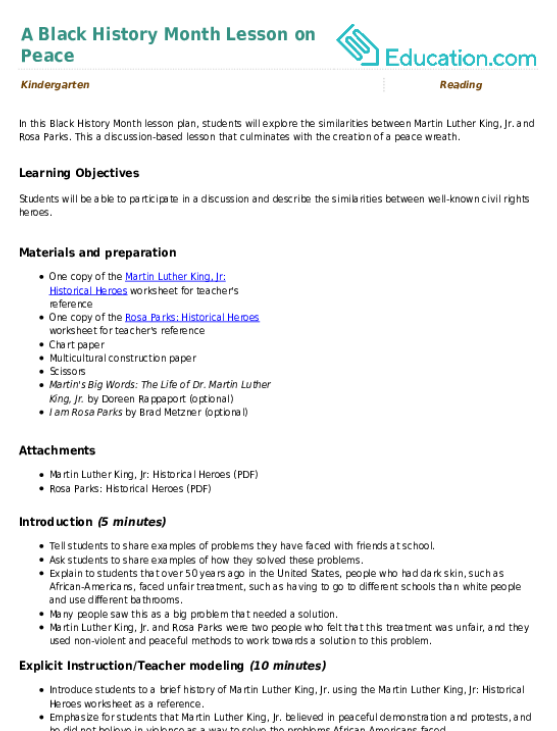 Read one of the following informational texts: Busy ButterfliesOr From Caterpillar to Butterfly. Pause throughout the read aloud to check for understanding about the concepts in the book. Model a think aloud that shows students how to make connections between the book and what you know about the topic of butterflies from your own life. For example, say, "One Key detailI find interesting is that a caterpillar turns into a butterfly. A key detail is something the author tells us that connects with the TopicOf the text...which is the life cycle of a butterfly. I find this key detail interesting because I've seen a caterpillar before, and a butterfly, but I've never seen the caterpillar change to a butterfly! This also reminds me of one of my favorite books, The Very Hungry CaterpillarBy Eric Carle." Encourage students to think about their own connections to the text, using Key detailsFrom the text to support their ideas. Ask student volunteers share their connections/ideas with the class. Model to the class how to retell important details from the book. Discuss with the class what information is really important to remember, and what other details are not needed in this lesson. 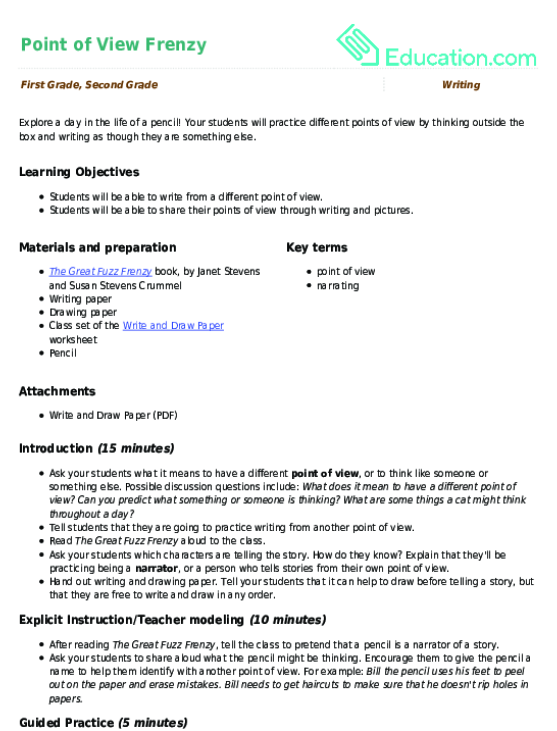 Jot down a few key details from the text (using words/phrases/illustrations) on the whiteboard and a few facts or ideas from the text that are not important to the main topic of the text. Have students think-pair-share which words/phrases/illustrations are key details and which are not. Encourage students to justify their reasoning, using their knowledge of Key detailsTo support their answers. 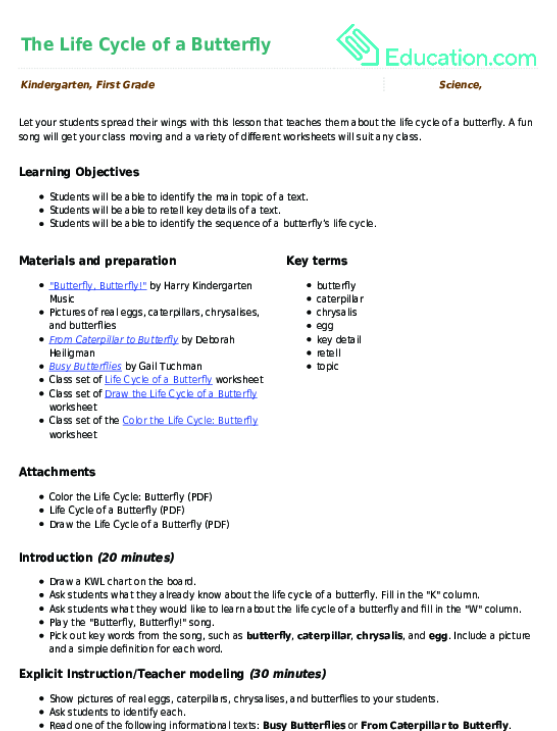 Pass out the Life Cycle of a Butterfly worksheet and have students complete it independently. 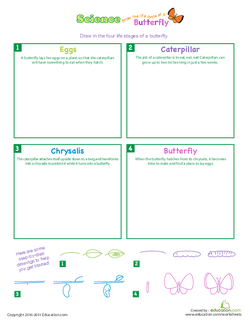 Enrichment:Give students the Draw the Life Cycle of a Butterfly worksheet to complete during independent working time. 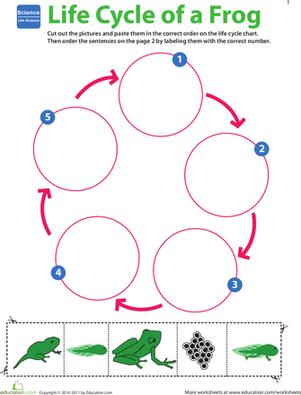 Support:Give students the colour the Life Cycle: Butterfly worksheet to complete during independent working time. Check students' worksheets for accuracy and clarify any misconceptions. Go through the KWL chart on the board and check off things in the "W" column that the class achieved in learning today. Add items to the "L" column to show students what they learned today. Review the life stages of a butterfly as you do this. What is a main topic? What is a key detail? How does identifying the main topic and key detail of a text help us understand what we read? This a discussion-based lesson that culminates with the creation of a peace wreath. Students will choose four pages from their nonfiction book to summarize, writing their sentences in the pages of the fun book graphic.